The Great Silk Road — in remote ages the caravan track, connecting the Eastern Asia with the Mediterranean. Basically on this way the silk from China was delivered, this is the reason of behind the name. The name Great Silk Road or Silk Route was coined by the German historian and geographer Ferdinand von Richthofen in 1877. It was started in 2nd century BC, run from Sian via Lunchjou to Dunjuan, where was split off. The northern way passed through Turphan. Next crossed Pamirs and was proceeded to Fergana and Kazakh steppes. The southern — beside Lob-Nor lake along the southern suburb Takla-Makan desert via Yarkend and Pamirs (in southern part) run to Baktriya, and then from there — to Parfiya, India and Mid East up to Mediterranean Sea. The length of the Great Silk Road was 12 thousand kilometers. It was starting on the shore of the Yellow Sea and leading to Eastern Turkestan, Central Asia, Iran, Mesopotamia, towards the Mediterranean Sea coast. On this way there were big ancient cities – Sian, Dun-huang, Yarkend, Samarkand, Tashkent, Bukhara, Merv. From Sogd to China woolen fabrics, carpets, different jewelries and precious stones were being carried. From Fergana – thoroughbred horses, from Badakhshan – lapis lazuli were being delivered. From India to Central Asia caravans came with cotton fabrics and cotton seeds. From China rice was being delivered. And from Central Asia to China – grapes, walnuts, pomegranate fruits and other products of agriculture were being delivered. – the northern track – from the north of China via Pamir and Aral Sea area to Lower Volga and to the black Sea basin. Between the southern and northern tracks were available a few connected and transitional routes. In process of time the communication network made ever more, consisted more branch lines. The main routes displaced to that northern, or southern way. World commerce took up the breadth within Kushan period, that contributed to consolidate the Great Silk Route. Such Route assured political and diplomatic communications formation. Besides, it assured to expand religions, cultures transfusion and turn around the technological innovations. In XIII c., soon after the Central Asia capture by Mongols, the Great Silk Road changed slightly its directions. Many of caravans which passed by Movarounakhr (i.e.central Asia), run directly to Volga Caspian Sea north. And from there moved to the Black Sea. By reason, that after Moguls the region was practically destroyed. Amir Timur, who became Movarounnahr and Khorasan ruler in 1370, tried to restore the Silk Road routes passing through the territory of Central Asia. Actually he simply repeated on the Volga River what Genghis Khan did in Movarounnahr, devastating it. Caravans once again took the road through Herat, Balkh and Samarkand. The main functions of the Great Silk Road were: to exchange goods and information, to accumulate and disseminate new technologies and religions (Buddhism, Nestorianism), to establish diplomatic relations, as many embassies were sent with caravans. For Central Asia, the Great Silk Road has become a factor of rapid and efficient growth and development. The role of Central Asia itself on the Great Silk Road was also important. It functioned as a storage medium. Later, the new technologies of that time were transferred from Central Asia to other countries. Central Asian goods were also highly valued. The Great Silk Route history — this is the history of cultural cooperation and exchange between the nationals of East and West. It demonstrates, that just the close collaboration and cultures cross-fertilization may represent peace basis as well as progress for the humans. Central Asia has never been distant from the main centers of world civilization. This region influenced not just the social, economic and cultural development of the neighboring countries (Sumer, Assyria, Media, Iran, India), but had also some contacts with Transcaucasia, the Mediterranean, the Volga region, and the nomadic tribes of the south of modern Russia and Kazakhstan. Since the Achaemenids, Greek colonies were appearing here. The intensive process of mutual influence among the cultures of neighboring countries began. This process was enhanced after the Alexander the Great conquests. Although the political life of Greek states in Central Asia was of a short-duration, the Greek and the Central Asian cultures integration process contributed to the great spiritual and material culture expansion in the region. Within that period, relations between the Central Asia and Indian cultures as well as Eastern Mediterranean were continued. Around the 3rd c. BC the contacts with China were established. Over the period of the Great Silk Road in towns and settlements, where caravan processions were passed, caravansary (hostelries) . Hujiras (lounges) for merchants as well as for service caravan staff, camels placing, lodgments for horses, mules and donkeys, feed and food staffs required were arranged over there. Caravanserai was the place, where one could sell and buy in bulk good-looking for merchant products, and the main – to find out the latest business news, and first of all, quotations fir goods. Khorezm, Sogdiana and Fergana appeared as succeed commercial centers. The Silk Route promoted the need in such Central Asian commodities as, horses and feed crops, as well as grape and cotton were in high demand. In towns craftsmen mastered new types of handicraft: iron items manufacture, was adopted from East, as well as glass items manufacture – from West. In I c. A.C. in the territory of Central Asia was formed Kushan state, the first governor of that was Kudzula Kadfiz. The state capital, probably, existed the town at the site of Dalvarzintepa, in the valley of Surkhandarya. 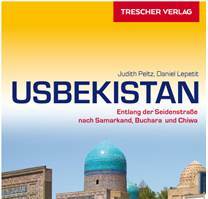 Within the ruling of Kudzul Kadfiz along the current Uzbekistan and Tajikistan southern areas were included Afghanistan and Kashmir to the structure of Kushan State. In the time ruling of Kanishka (78-123 yy. A.C.) the Kushan state spread its expansion to East: consolidated its domains in India, then the state capital was moved from Baktriya to Peshavar (on the north of India) and turned into the huge empire, occupied the territory from India and Khotan till the south of Uzbekistan and Afghanistan. New towns were under the construction, crafts were developed and commercial contacts with India, China and the Rome were established. on the north- via Khorezm with Eastern Europe. The main route was run via Dunkhuan, Khami, Turfan, Kashgar, Uzgen, Osh, Kuva, Andijan, Kokand, Samarkand, Bukhara and Merv. In Merv (the existing town Mary in Turkmenistan) the Great Silk Route was split off. The one branch run via Khorezm to Volga, to Eastern Europe. Thus, the commodities from China, India, Central Asia reached Rus: Kiev, Novgorod, and later on Moscow. In Moscow market place was proposed the special, so-called, «Indian» strip mall, where merchandised mainly eastern, Indian negotiators. The other branch run via Balkh and the lands of the current Afghanistan to India. The third one- run to Baghdad and next to Mediterranean Sea. Here the commodities reloaded to boats and reached Egypt, Eastern Roman Empire, Italy. As well as so-called «silver» route was existed, where passed caravan processions carried the Central Asian silver to the states, where silver was in short supply: via Khazar Kaganate, Bulgarian State- to Kievan Russia as well as to Europe states. From the Iranian-Byzantine wars near the VI century along the territory of Northern Caucasus was constructed the Great Silk Route track. Such occurred from the effort to disrupt the commercial relations of Eastern Roman Empire through the merchants high duty imposition. On the back of that the caravan processions from China and Central Asia moved by-passing Iran. They started to round the Caspian Sea not from the South, but from the north— moved via Northern Caspian Sea Region to Northern Caucasus. Therefore there were appeared the two Great Silk Route branches in Caucasus— Misymianskiy and Darinskiy routes.